My Bio by one Evelyn McDonnell.... Top Writer! There’s a myth about music critics that says we are frustrated, wannabe performers. 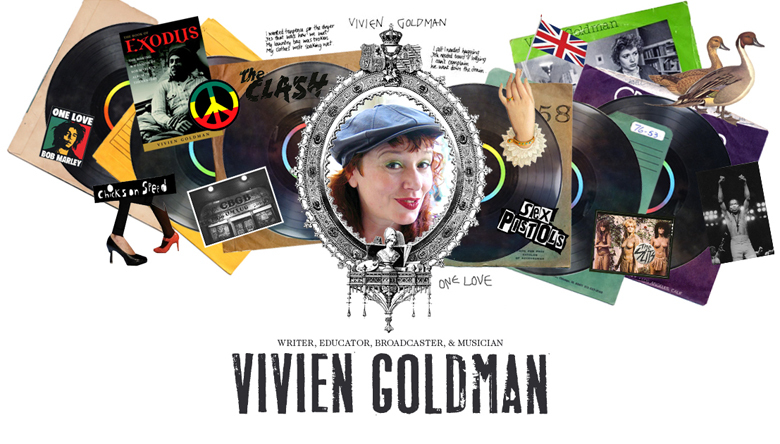 Evidence to the contrary: Vivien Goldman. Ever since she migrated from pitching editors on the little-known music of Robert Nesta Marley to becoming one of the foremost chroniclers of the perfect storm of reggae, punk, hiphop and Afro-Beat, the London-born, New York-based Goldman has made documenting music her primary life work. But between 1979-82, Goldman was also a working musician, creating songs that, years later, would be sampled by The Roots and Madlib. These rare girl grooves are now collected for the first time on Resolutionary, courtesy of Staubgold Records. Resolutionary takes us through Vivien’s first three musical formations: first as a member of experimental British New Wavers The Flying Lizards; next as a solo artist, with her single “Launderette,” featuring postpunk luminaries; and then as half of the Parisian duo Chantage, with Afro-Parisian chanteuse Eve Blouin. Goldman’s synthesis of post-colonial rhythms and experimental sounds are threaded together by her canary vocal tones and womanist themes. Her eclectic musical crew included PiL’s John Lydon, Keith Levene and Bruce Smith; avant- gardists Steve Beresford and David Toop; The Raincoats’ Vicky Aspinall; the mighty Robert Wyatt; Zaire’s Jerry Malekani; Manu Dibango’s guitarist; and Viv Albertine, then of her good friends, the Slits. The majority of the tracks were produced by dubmaster Adrian Sherwood, and Resolutionary channels the history of a time when the bon-vivant voice of music was in the air, and Vivien Goldman was its eyes, ears, and mouth. Goldman’s talent did not go unnoticed by the many musicians with whom she was surrounded, particularly in the late 1970s bohemian enclave of Ladbroke Grove, where punk had loosened tongues and dub was freeing body and soul. “The Punk Professor” began her singing career in the late ‘70s, doing backup with Neneh Cherry and Ari-Up (the Slits) on Sherwood records by reggae artists, including Prince Far I. It was a time of musical fermentation, collaboration, and experimentation - and of post-punk boundary breaking. An American ex-pat music writer for NME could also become a rock legend, crashing at her colleague’s pad along the way: Goldman has a gorgeous cameo in Chrissie Hynde’s 2015 memoir Reckless. In the early 1980s, Goldman moved to Paris where she formed the duo Chantage with Eve Blouin. Reggae had been her London soundtrack; but in France, she absorbed music from Africa judiciously. “People in Paris were digging fusion; it was very much a two-way street. There were lots of African musicians and experimentations with synthesizers. It was a time of exchange, of new technology finding its balance with traditional instrumentation.” That interplay is audible in Chantage’s exultant, wholly original mash-ups, like the post-nationalism of “It’s Only Money,” a mix of steel pan, African soukous guitar and sobbing gypsy violin riding ferocious funk. Post-Chantage, though, new media drew Goldman home. “Suddenly there was work for independent filmmakers,” she says. “I was asked to work in television. And I like telling stories. My lyrics are usually stories, too.” Along with co-initiating the 1980s global music TV series Big World Café, Goldman co-directed videos like Eric B. and Rakim’s “I Ain’t No Joke,” which was exhibited at NY’s Museum of the Moving Image. As the 1990s began, she moved to Manhattan and became New York University’s “Punk Professor,” teaching original courses on Punk, Bob Marley, David Bowie and Fela Kuti. And as always, she writes and broadcasts prodigiously about music generally. Goldman’s five books include the “Book of Bob Marley’s Exodus.” And equally, she has never stopped singing and writing songs. Chicks on Speed released a later cut, “7 Days,” with singer Andy Caine and Manasseh Sound System, on their 2009 Girl Monster compilation. Her house 12” records with singer Andy Caine and producers Alex Marsh’s Grasshopper and Berlin’s Moritz von Oswald, are compiled on LP’s. Goldman has also co-written tracks with Massive Attack, Coldcut, Ryuichi Sakamoto, and Luscious Jackson. Early in 2016, she performed dub readings onstage with Boston’s Berklee Marley Ensemble. Her multi-media beat goes on.